Tired of cleaning, rinsing and sanitizing 50+ bottles every time you finish making a 5 gallon batch of beer? Bottling is consistently the homebrewer's least favorite part of brewing, and for good reason. But what if you could have cold, tasty draft beer on hand at any given time, and only have to deal with one, big container instead of a bunch of bottles? Not only that, priming sugar and the possibility of bottle bombs become things of the past as you are able to force-carbonate your beer to whatever carbonation level you like. 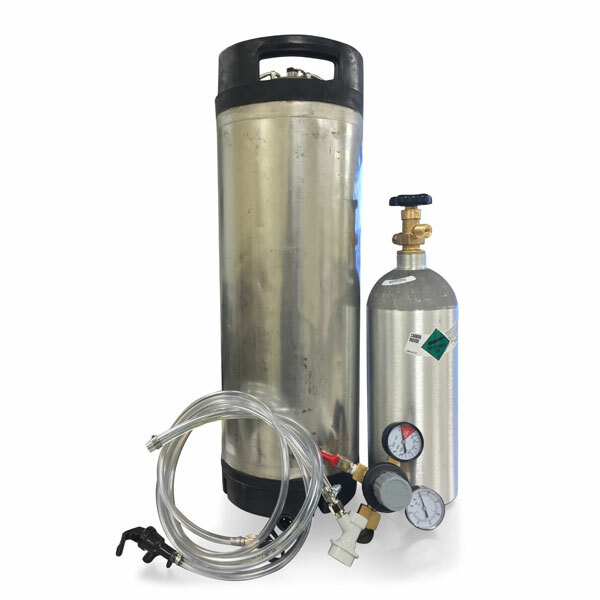 Great Fermentations' Ball Lock Kegging system comes with everything you need to keg and dispense your homebrew! 5 lb. used CO2 tank, which comes empty when shipped (as pressurized CO2 tanks cannot be shipped) or full when picked up at the store.